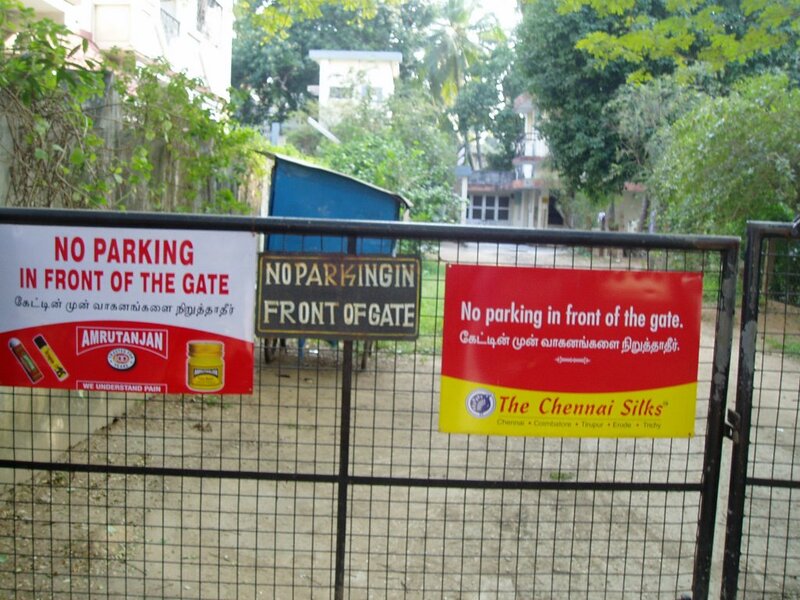 For a while now, Chennai has been a city of posters, but now it is also a city of billboards. Hoarding (mostly illegal) have mushroomed all over Chennai. Marketing starts even before you enter Chennai. Yes, giant hoarding now dot the periphery of Chennai Airport and they are visible as plane lands. But, the marketers are still hungry for space and their latest victim are the gates of residential properties. 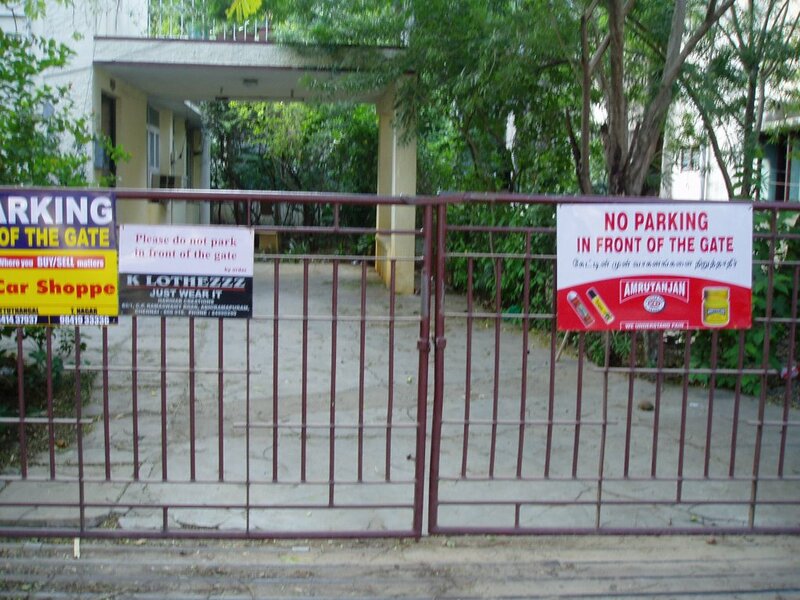 With the increasing vehicles on the Chennai roads, it is customary to see Don't park in front of the gate in the gates of most of the residential properties. This small sign is now the latest victim of the space hungry marketers. 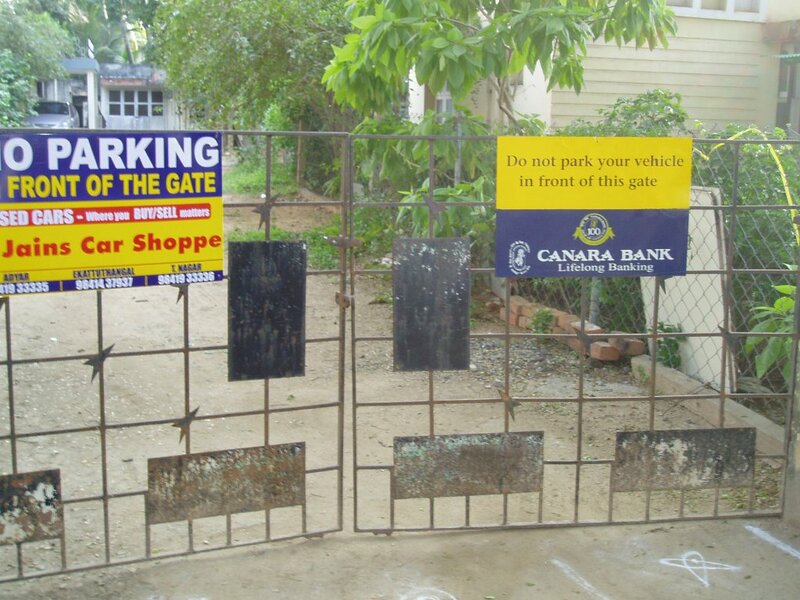 Very often, with out permission, large sign boards will sprung up in the gates selling from anything from mosquito coils to banking services. Oh, yes they will also say the obligatory 'Don't park in front of the gate' statement in bilingual. These boards come up uninvited and there is fierce competition amongst various agencies for space. It is not uncommon to see various agencies fighting it out (literally) about missing boards and space. Of course, they fight amongst themselves and hardly ever bother to seek permission from the property owner. Also, I am not aware any payment being made to the property owners for putting up these signs. Very soon, they will run out of space in these gates and would be looking for the next victim and that could be you. Be warned, If you stand still in Chennai.. a poster could be stuck on you. Just that one has to apply common sense and look around while parking vehicles ! Singara chennai might become Poster chennai..!! 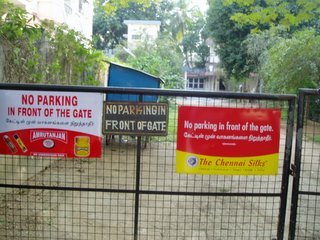 I noticed these posters in front of many gates in Chennai during my recent visit. But, I had thought that the owners would have given permission for these posters..
did not realise they are put up with out any permission! 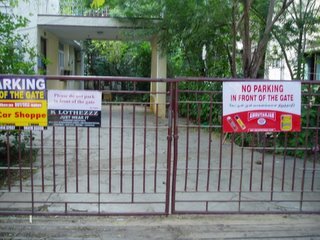 With the explosive growth of vehicles in Chennai.. parking is always a challenge..
Not that these boards make a difference.. people / Autos park at their will anyways.. I asked around my neighborhood where I took these photos.. no permission was asked or given..
why 'surprised' about Canara Bank ? (Public sector bank and stuff???..).. Everyone works through some marketing agency and this must be their handi work.. Interesting to read this.!! What a concept..these advertisers have come up with.!! Uninvited! yes.. these guys come up with some unique things..
Compund wall space grab is in full swing now.. for the impending 2006 assembly election. how long does it take for an concept like this to travel to Bangalore.. Welcome to the flat world..
Good and the bad spreads fast.. bad spreads faster than we desire..